Wearing brand new dresses for the first time: Joely and Jawaria were begging on the streets until recently. When I first saw their little faces I fell in love with them. When I learned their story I fought back tears for them. But when I realized that God had made it possible for Heaven’s Family to intervene, I rejoiced for them. Life came very hard at Jawaria and Joely, two little street beggars in Pakistan. But because of Heaven’s Family (that’s you! ), things have turned around. Their full story is waiting for you to read. I love happy endings, and this update is full of them, accompanied with photos of smiling beneficiaries of your kindness. We can rejoice together, because our obedience to Jesus is what has put the smiles on their faces. Be blessed as you read their stories. Fifteen years ago Iqbal Masih of Pakistan was diagnosed with cancer. Over a period of three years, he and his wife, Kalsom, sold their small house and most of their possessions to pay for his treatment. But he died in the end, leaving Kalsom destitute. Their only son took her in, but he was a drug addict, and eventually sold everything he owned to sustain his habit. He died of a drug overdose seven years after the death of his father. Worse, by that time Kalsom had gone blind. She was left with her daughter-in-law—who had no marketable skills in a culture that has very limited opportunities for women—and her two granddaughters, Jawaria and Joely. Kalsom’s widowed daughter-in-law remarried in 2003, becoming a Muslim in order to marry a Muslim. Her new husband would not accept her two daughters. So she left both girls with Kalsom. The girls have never seen their mother again. Jawaria and Joely were then forced to beg in the streets just for survival. They’ve been supporting themselves and their blind grandmother for four years, living together in a one-room house that is hardly fit for animals. It floods with water during a hard rain. Neither Jawaria or Joely have been able to attend school, because they can’t afford the school fees that amount to about $250 a year. Kalsom is a Christian, and so are the two girls. Since 2004 they’ve attended a small house church of people who are equally as poor. I’m happy to report that the future is now looking a little brighter for Kalsom and her granddaughters. Because of gifts to the Widows Fund, we’re helping her purchase a small house. It isn’t much by Western standards, but it has two bedrooms and a kitchen, its own toilet and water pump. Now we’re praying to help Kalsom set up and stock a little shop out front where she can earn a living with the help of her granddaughters—so they can both afford to go to school. Pray for Kalsom’s health so that she’ll be able to take care of Jawaria and Joely until they can take care of themselves. And thanks for caring. Each month the Widows Fund helps numerous Christian widows in very poor nations by providing life-saving assistance and grants for launching life-sustaining small businesses. Last month, for example, your gifts made it possible for eight widows in Sri Lanka to start small businesses. Even from a young age, Suresh Babu could not understand why Indian people bow down before idols. He rejected the Hindu gods of his parents and declared himself an atheist. Rebellious and proud, his life became a futile search for happiness in money, politics and marriage. Nothing worked. Ultimately he found himself planning suicide. God had better plans, however, and Suresh met some Christians. They told him, for the first time in his life, about Jesus Christ. He heard that his sins could be forgiven and that he could experience new life. Suresh Babu believed. That was in 2004. Suresh soon led his wife, Prameela, to the Lord. They started sharing the gospel from house to house in the Idukki District of the Indian state of Kerala. God anointed them with spiritual gifts and people were healed and delivered from demons and alcoholism. So Suresh and Prameela opened their small home for a Bible study. Fifty people now attend regularly. In 2007 the Lord also gave Suresh and Prameela a vision to open their home to orphaned street children from their community. Today eleven orphan boys live with them due to the kindness of an overseas sponsor who sends $250 a month. They are a happy family, shining the light of Christ to their neighbors. This lantern is a great help in our ministry and will lead many into light. This is a great evangelism tool for us. As the believers come from a very poor background, we were unable to buy one ourselves. So we thank God and Heaven’s Family for helping us with the lantern. May God bless you richly. Just $25 provides a lantern for a church planter in India. We currently have requests for twenty. One of the core biblical principles that we’re emphasizing to pastors and Christian leaders around the world is that of discipleship. If you’ve ever read The Disciple-Making Minister, you know that. Discipleship is not accomplished by means of once-a-week lectures to Sunday crowds, but relationally, person-to-person, and teaching is more by example than precept. True discipleship is done, not by superstar leaders, but by servants, and it results in the multiplication of more disciples. In East Africa, so far, we’ve printed 15,000 English, Swahili and Kirundi copies of The Disciple-Making Minister. Most have already been distributed to Christian leaders. This has proven to be a catalyst for the multiplication of disciples. In our fellowship of 10 churches we had nearly 500 members, but after receiving The Disciple-Making Minister, I made it a priority to study, and after looking at it closely, I requested more books….I gave the books to ten of our pastors, and as I speak, we now have more than 50 pastors in our fellowship who are planting churches. And again we discovered that you can even have church in homes, so we now have more than 2,000 people in our fellowships. This has just happened in less than a year. I just came back for more books which I am glad I was given 100 books to take to some parts of Uganda and Kenya with me. One thing I got much blessed with was the perspective of the church. It took us long but this has opened our eyes to see the potential in us of planting and growing churches. The TDMM books have become a manual and a tool in our hands. May the Lord keep you going strong. You have really touched hearts. God bless you David Servant. The Disciple-Making Minister has just been translated into “East African French,” and we have open doors to distribute it to pastors in the Democratic Republic of Congo, where there are more French-speaking people than there are in France. We also need to print thousands of additional copies in English and Swahili for East African pastors. The Disciple-Making Minister is much more than a booklet; its 500 pages cover many topics of relevance to pastors. Ten dollars usually prints at least three copies. Because of your help, we’ve printed and distributed over 100,000 copies of The Disciple-Making Minister in twenty languages to pastors and Christian leaders around the globe. Invest an average of three minutes each day, Monday through Friday only, and read the entire New Testament in 2009! Invest another three minutes, and you can read David Servant’s corresponding daily commentary, HeavenWord Daily, sent directly to you via email every morning. Did you know that a person with an average reading speed (230 words per minute) can read through the entire New Testament in one year, reading just three minutes a day, five days a week? It’s true! I hope you will join me in reading through the New Testament in 2009. If you can spare another three minutes to read no more than 700 additional words each day, I’ve written a corresponding daily commentary, HeavenWord Daily, that we can email to you every day. These are not “fluff devotionals.” Rather, they are truth-filled “motivationals,” written for true disciples of Jesus. There’s a sample of one day’s devotional below. They are never longer than 700 words. 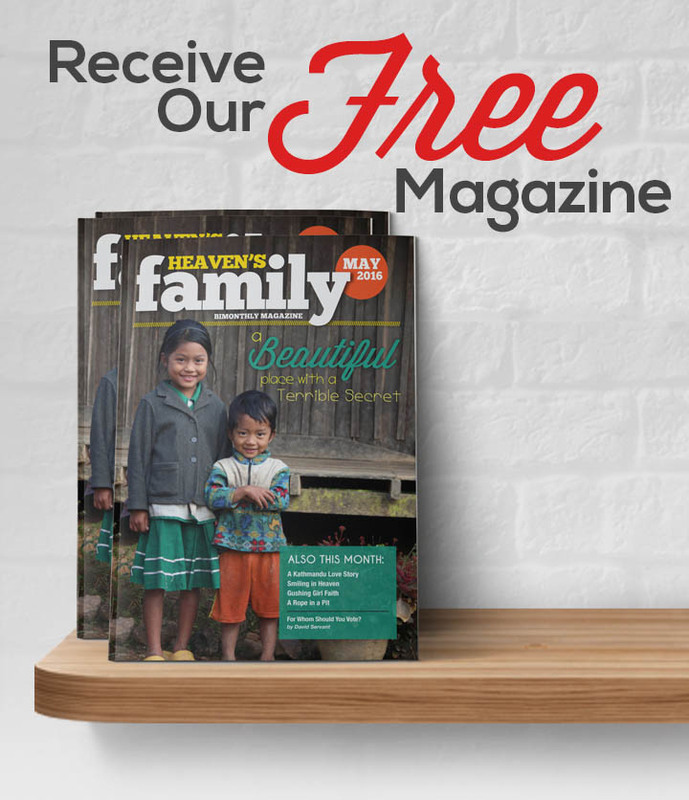 To begin receiving HeavenWord Daily by email, just log in to your account at HeavensFamily.org. If you haven’t opened an account yet at our website, it just takes a minute. Make sure your email address is correct, and then click on My Account>My Email Subscriptions and check “HeavenWord Daily.” Starting January 1st, it will be in your inbox every morning. This service is free. Today we can glean two very important lessons about God’s guidance. By means of a star, God led the wise men from the east. They likely traveled for months as the star led them westward towards Jerusalem, the logical place to find the newborn “King of the Jews.” At some point they apparently lost sight of the star (see 2:10), either because it disappeared or because they didn’t pay close enough attention, having made the assumption that Jerusalem was their final destination. But after conferring with Herod—who himself conferred with chief priests and scribes—they headed towards Bethlehem, just six miles south of Jerusalem, once again following the star that had led them for months. It led them directly to Jesus. The point is this: Keep watching the star, and never make assumptions about God’s guidance. Many of us have been like the wise men, following God’s guidance for a while, but making an assumption along the way, and thus missing His specific direction. We get near to God’s perfect will, but not as close as He wants us to be, and miss out on His greatest blessings that are waiting for us. The Holy Spirit is God’s star in our hearts, leading us to walk in the specific good works that He has prepared beforehand (see Eph. 2:10). To stay on course we must continue seeking God. In the case of Joseph, an angel of the Lord told him to return to Israel from Egypt with Jesus and Mary. When Joseph obeyed those instructions, he then received more specific guidance to go to Galilee rather than Judea. Here is the second lesson: Don’t expect God to lay out the entire plan before you start. He leads us one step at a time, and we must walk by faith. Once we obey His first step, then He will reveal the next step. If you refuse to budge until God has revealed His entire plan to you, you will miss out on His blessings that are waiting. We must prove to God that we trust Him and walk by faith. Take note that, contrary to what we see in movies about Jesus’ birth, the wise men didn’t visit Jesus when He was a newborn, but probably when He was closer to two years old. They visited Him when He was in a house, but we know Jesus was born in a stable or a cave and that He was laid in a feeding trough right after His birth (see Luke 2:7). Additionally, we read today that Herod had all of the male children of Bethlehem and its environs murdered who “were from two years old and under, according to the time which he had ascertained” from the wise men (2:16). Why did God prevent Jesus’ death at the hand of Herod’s soldiers but not prevent the deaths of so many other children in Bethlehem? We don’t know because the Bible doesn’t say. But one truth becomes very clear to us as we read this tragic story: Jesus was special. His life was of much greater importance than the lives of any other child in Bethlehem. In fact, if we compared the value of Jesus with the value of all other human beings combined, His value would infinitely exceed their combined value, as He is God. Finally, take note that the wise men traveled for months (and perhaps even years) with the intention of finding and worshiping the King of the Jews (see 2:2). When they finally beheld the tiny king, “They fell down and worshiped Him” (2:11) and gave Him precious gifts. They knew Jesus was no ordinary baby—He was God in the flesh, a person who was worthy of worship. Jesus cannot be just our “buddy” or “pal.” He must be our God, who deserves our devotion and obedience. Is that how you relate to Him? Ever feel like you are standing alone against the tide? Maria Chepurna knows how you feel. She lives in the village of Zhitin, in western Ukraine. Of the 500 residents there, Maria is the solitary believer. Her husband is a communist and atheist. Their only daughter is an Orthodox nun (which in her case means she is very religious, but completely opposed to her mother’s simple faith in Jesus). Not discouraged, Maria has been sharing the gospel with her neighbors, most of whom are extremely poor by American standards. Heaven’s Family was blessed to help Maria with her outreach when International Director Chuck King visited her, bringing bags of food purchased with gifts to the Food Fund. They distributed the food to five of Maria’s poorest neighbors. I have been to many, many poor nations to visit our poor brothers and sisters in Christ, but I must tell you, the poverty and desperation of these three families was shocking to me….I admit, in my personal weakness, that I could barely stand to be in their homes! Yet I was grateful and honored to be there to meet such poor folks, and to briefly share the gospel with several who were unbelievers. Pastor Peter is planning to also visit them in the future to continue this outreach….It was obvious that the poor believers we helped were living in clean homes, while many of the unbelievers we helped lived in filth. Interesting! Chuck also preached in Ukrainian churches and conducted meetings for pastors, distributing 130 copies of the Russian translation of The Disciple-Making Minister. Gifts to the Food Fund provide food for hungry believers and for unbelievers who are listening to the gospel in developing nations. With Christmas just a few weeks away, people are wasting money at an accelerated rate, purchasing gifts that will sit in closets, toy boxes and attics…and eventually in garbage cans. Since we’re celebrating the birth of God’s son, why not buy gifts that will help others know and serve Him? Why not lay up treasure in heaven this Christmas? We’ve got some ideas for you. How about our new DVD pack containing twenty-one teaching lessons through the Sermon on the Mount? Filmed in Galilee near the place that Jesus originally delivered His most famous sermon, each half-hour teaching by David Servant examines the heart of Jesus’ challenging and life-changing message. Every episode also includes an interesting side trip to a historical biblical site in Israel. This DVD pack is only $45 (including shipping within the U.S.). You can order the DVD set securely by credit card online. December 15 is the deadline to order to guarantee delivery by December 25! We’ve also set up a Christmas Gift Card section at both I Was Hungry and Orphan’s Tear so that you can give, in honor of a loved one, clothing to a Christian orphan who will receive no other gift this year for Christmas, a business start-up grant for a poor Christian widow, food for a starving believer in North Korea, and so on. The gift cards are beautiful. We can mail your card to your address or directly to your loved ones. Your card will say exactly what need has been met in their honor. It only takes a minute to order your cards using the simple forms at I Was Hungry and Orphan’s Tear, and you can use your credit card or check to make a payment. You could probably do all your Christmas shopping in thirty minutes just sitting at your computer! Or you can call us at (412) 833-5826 and order your cards over the phone. And as always, nothing is taken for administration of your gift. 100% of what is received is sent to the designated need. The deadline for ordering your cards is December 15 in order to have your gift cards in your mailbox (or your loved-ones mailboxes) by December 25! One Heaven of a Year! Looking back at 2008, I’m amazed and humbled by what has been accomplished. Thousands of lives have been touched around the world due to God’s grace working through the friends of Heaven’s Family. We’ve cared for orphans, widows, lepers, pastors, refugees, the persecuted, the poor, the handicapped, the hungry, and many others who are among “the least of these” in our spiritual family. Thank you for your obedience to Christ. You have laid up treasure in heaven. What is in store for 2009? Only God knows. But we know that we, like Jesus, are supposed to “keep working as long as it is day” (John 9:4). There are going to be hundreds of opportunities to show our love for Jesus by serving His family. The only thing that can limit us is our own hearts. I encourage you to continue to “find your life by losing it for Jesus’ sake” (Matt. 16:25). This little guy seems as if he has big plans on the horizon!